*I loved The Chosen One so when St. Martins asked me if I wanted to review this book, I immediately said yes. I even have an extra ARC for a giveaway, so keep your eye out for one coming up soon. Thank you St. Martins! Goodreads says, "Thirteen-year-old Lacey wakes to a beautiful summer morning excited to begin her new job at the library, just as her mother is supposed to start work at the grocery store. Lacey hopes that her mother's ghosts have finally been laid to rest; after all, she seems so much better these days, and they really do need the money. But as the hours tick by and memories come flooding back, a day full of hope spins terrifyingly out of control...."
*This is one of those books that I meant to buy last summer, but never got around to it. I don't know about you, but after this crazy winter, I could use a book about the sun, sand and beach. Goodreads says, "Sometimes I still wake up shivering in the early hours of the morning, drowning in dreams of being out there in the ocean that summer, of looking up at the moon and feeling as invisible and free as a fish. But I'm jumping ahead, and to tell the story right I have to go back to the very beginning. To a place called Indigo Beach. To a boy with pale skin that glowed against the dark waves. To the start of something neither of us could have predicted, and which would mark us forever, making everything that came after and before seem like it belonged to another life. My name is Mia Gordon: I was sixteen years old, and I remember everything." *This cover immediately caught my eye when I was at the library. I enjoyed Noel's Immortals series and the spin-off Shimmer series, so I am excited to read a realistic fiction. Goodreads says, "Having recently discarded her dorky image--and the best friend that went with it--Colby Cavendish is looking forward to a long hot season of parties, beach BBQ’s, and hopefully, more hook-ups with Levi Bonham, the hottest guy in school. But her world comes crashing down when her parents send her away to spend the summer in Greece with her crazy aunt Tally. Stranded on a boring island with no malls, no cell phone reception, and an aunt who talks to her plants, Colby worries that her new friends have forgotten all about her. But when she meets Yannis, a cute Greek local, everything changes. She experiences something deeper and more intense than a summer fling, and it forces her to see herself, and the life she left behind, in a whole new way." *I love her Sookie Stackhouse series and Becky at The Bookette told me about this other series and its similarities to The Body Finder. I got this one as an audio CD from the library and am listening to it in the car to and from work. So far it is very good! Goodreads says, "The first book in Charlaine Harris's mystery series introduces readers to Harper Connelly, a strange young woman who -- after being struck by lightning as a child -- is able to locate dead people and determine exactly how they died. Accompanied by her stepbrother, Tolliver (who works as her manager), Harper heads to small-town Arkansas for their next job. Her client is a socialite named Sybil Teague, who wants Harper to find a teenage girl who disappeared on the day her son was found shot dead in the woods. The girl, Monteen "Teenie" Hopkins, has a reputation for being "wild as a razorback," and scandalous rumors abound about the two. But once Harper locates Teenie's corpse a short distance from the spot where Sybil's son died and reveals that she was shot in the back while trying to escape, the real trouble starts. As more town residents begin to turn up dead -- and with her brother in jail on bogus charges -- Harper must find the real killer before she becomes his next victim." *I got this one through S&S Galley Grab. I am a fan of Scott and excited to see if this one is as good as her other novels. I also adore this cover! Goodreads says, "Abby accepted that she can’t measure up to her beautiful, magnetic sister Tess a long time ago, and knows exactly what she is: Second best. Invisible. Until the accident. Now Tess is in a coma, and Abby’s life is on hold. It may have been hard living with Tess, but it's nothing compared to living without her. She's got a plan to bring Tess back though, involving the gorgeous and mysterious Eli, but then Abby learns something about Tess, something that was always there, but that she’d never seen. Abby is about to find out that truth isn't always what you think it is, and that life holds more than she ever thought it could..."
Grave Sight is a really good book! I've read the first three books in the series, all have been great. I hope you enjoy it! I have The Summer of Skinny Dipping on my wishlist - I think I'm going to buy it and save it for my holiday though! All of these look fantastic! I can't wait to hear what you think of Miles From Ordinary. I've been wanting to try Grave Sight as well. It sounds fantastic and I'm glad you are enjoying it so far. The Chosen One was one of my favorite reads last year, so I'm super excited about Miles From Ordinary too. I can't wait to get my hands on it. I loved THE CHOSEN ONE, too! I've been hearing the MILES FROM ORDINARY title thrown around all over the place, but I never realized it was Carol Lynch Williams. I'll definitely have to check it out now! Happy reading! Going to look up this other Harris series. I've heard about it but have yet to pick it up. love all the summery books! i've had summer of skinny dipping for so long but I haven't had a chance to read it. it looks so good though! 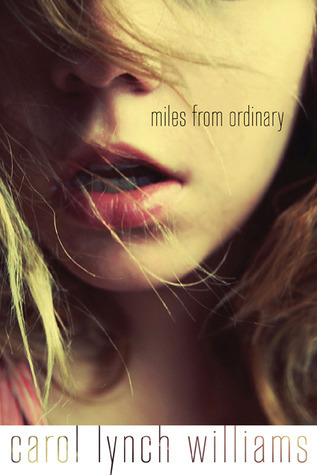 Miles from Ordinary sounds amazing---I'll be keeping an eye out for your giveaway! These all look like fun reads! You got a lot of great sounding books. We even have one in common this week. Cool. Thanks for visiting, everyone! Happy reading!